In flatweaving there are a number of different types of loom and weaving techniques but for purposes herein, the various types can be catogorized into two general groups. 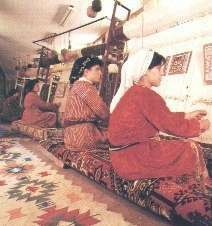 The first grouping contains the basic flatweave technique, or "kilim weaving". In a kilim, the pattern is formed by passing a yarn of a particular colour over and over and under the vertical yarns (known as warps) for the duration of the particular colour or design motif, then the same horizontal yarn (known as weft) is turned on the same path (next row) along the edge of the same coloured motif. This process is continued until the individual motif is completed. Then the next motif is started where the initial one finishes, but the two yarn colours are not normally joined together in anyway, thus causing a slit to appear between the two respective yarns. Each block of colour is then woven succesively until the whole kilim is completed. When you hold a kilim woven in this way up to the light, you can easily see the slits where two patterns meet but do not join. The second grouping contains flatweaves which employ the technique of way wrapping or brocading. A motif is created by adding a third yarn to the warp and weft yarns which is wrapped arround the warp yarns in several configirations depent upon whether the intent is to weave Cicim, Zili, or Sumak. 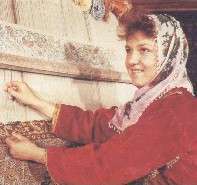 In Cicim, the motifs are usually scattered or in series, with no organic relationship between any two motifs, and the basic ground weave (warp and weft) shows through so that the Cicim motifs appear to be embroidered. In Zili the entire surface of the ground weave is normally covered with the design yarns and vertical lines, somewhat like cords, protrude to give Zili its distinctive appearance. In Sumak, the entire surface is also normally covered with the design yarns. All three techniques may be employed together in one flatweave if desired. Each of the 4 basic types of flat-weave also has a number of sub-groups with variations in technique (23 total). The Turkish knot is standart of yarn encirling two warp threads, with the loose ends rawn tightly between the two warps. The Persian knot is a strand of yarn that encircles one warp threads and winds loosely around the other warp. One loose end pulled through the two warps, while the other end goes to the outside of the paired warps. Rugs and the various flatwaves are made from five basic materials; sheep wool, goat hair, cotton, floss silk, and silk. The quality of wool varies according to the climate, the breed of sheep, and the time of year of the shearing. Wool from sheep that live in warm and arid regions is normally dry and brittle, and since it breaks so easly, it ends up being short and feels lifeless. Good quality wool comes from helthy and well fed sheep found in cold regions or at high elevations with good grazing lands and lots of water. In the colder regions, sheep grow a full fleece to keep warm and their bodies store fat which then translates to a high lanolin content within the fiber which reaches lengths of 10 cm. and more. The wool so obtained feels silky smooth and yet springy. Wool from the higher elevations (cooler also) and from the spring shearing is considered to be the highest quality. Wool is hand-spun by using primative utensils called kirmen (drop spindle) and by spinning wheels. Women usually spin the wool during idle moments and the street while spinning. In hand-spun wool, the original length of the fiber stays the same through the spinning process - a fiber tahat measured 7 cm. before spinning will still measure the same after spinning. Wool can also industrially spun, but the hard twisting of the fibers by the spinning machines tends to berak some of the fibers. Although the broken bits and shorter fibers can be made to adhere together through the use of oils during the spinning process, the fiber will have lost some of its strength, which, in turn, will shorten the life spun of the rugs to be woven. In rug and kilim weaving, cotton is used mostly for the warp threads, as well as for the wefts. Compaired to wool, cotton is generally considered to be a more residant fiber and it is less elastic. So, tighter knots can be tied on cotton warps as opposed to wool. If very tight knot are tied to a wool warp, the fiber will break much more frequantly than if the warps were of cotton. Consequentl, woolen pile rugs with high knoting density counts will normally have cotton warps, for example, in Hereke, Ladik, and Kayseri Bunyan carpets.